One of my favorite things about talking to seasoned entrepreneurs like Amy Vetter is that you never really know what’s going to come out of your discussions. Take Vetter, for example. She’s a CPA who knows her stuff. In fact, she acquired the accounting bug from her grandfather who was a CPA. But it turns out that Vetter is also a yoga instructor. And that she works as an advisor to accountants. And that she wrote a book that teaches entrepreneurs how to strike the right balance and find bliss in their professional lives. She is an unstoppable force, and there are a lot of lessons we can all learn from her. To listen to my interview with Amy, click play below, but make sure you keep reading too. While Vetter worked as a CPA, she discovered the life-changing benefits of yoga—not just for the improved health of her body, but also for her mind in both her personal and professional life. It was this sort of discovery of how to heal herself that first got her interested in helping small business owners run their businesses better. This is why she started pointing them towards the cloud. Scary prospect, right? This is why Vetter is a huge proponent of cloud-based accounting software. It enables business owners to automate the process of managing their business’s accounting. This frees them up to focus on other things and then engage with accountants in real-time, and when it’s most convenient for them to do so. 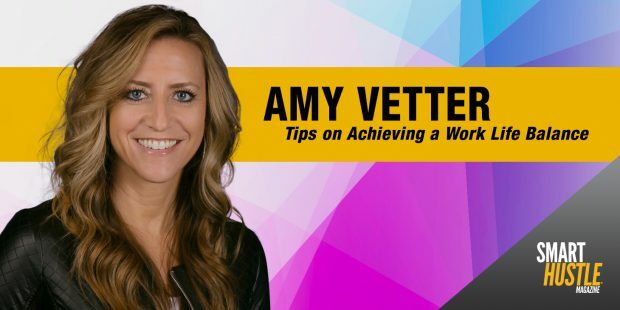 Achieve #work and #life balance using these tips from seasoned #entrepreneur @AmyVetterCPA. Despite Vetter’s expertise in accounting and the time-saving capabilities of using software to manage it, she’s also incredibly well-versed in striking the perfect work-life balance. Scratch that. As she explained, “Balance can sometimes be stressful, just the word. Work-life harmony really is something that I think we should strive for, that it really goes with the rhythm of our life.” So, let’s focus on how entrepreneurs can bring more harmony to their lives. Technology can be a huge boon to your company’s long-term success, “but it can also create conditions where there’s never a stopping point.” Your brain and your being need a break from work and it’s up to you to set boundaries. You may feel guilty about making that time for yourself, but Vetter says you shouldn’t. If you give yourself that time, you’ll be more productive when you come back to work. So stop trying to do everything yourself. In fact, get help as early on as you can. Business, Balance, Bliss. This method incorporates all the ideas from above into one healthy lifecycle. Basically, recognize an unhealthy business (or even life) situation that you commonly find yourself in. Determine a way to balance it with something more positive and healing for yourself. Then, create a way to make that balance a habit in your life. The goal? To change the way you work for the better.